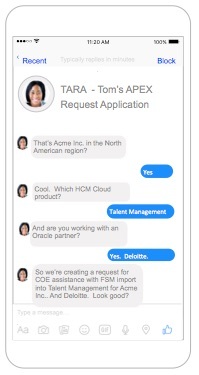 I recently spent a day with the Oracle Applications UX team in a Conversational UI for Enterprise SaaS workshop. Let’s be clear…in the context of this workshop, “Conversational UI” is a spiffy term meaning chatbots for enterprise applications. Amazing workshop put on by the UX team. Made even better by including a mix of attendees ranging from neophytes like me up to experienced experts sharing their tips and tricks. Messaging apps are growing at insane rates. For example, consider Facebook Messenger. It’s used by over 1 billion people every month and is outpacing the growth of Facebook itself. Getting things done with a bot is much faster than working through a website or mobile app. While websites and mobile apps have to be loaded and navigated, bots load instantly…and people will consistently choose the path that loads the quickest. 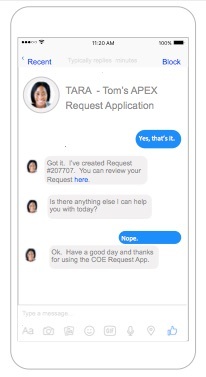 Bots win on the ease of use front as well. No navigation needed with a bot…just start the conversation. And…this is key…language is the interface people understand best, and it’s the interface used by a bot. Learning to code a chatbot is easy. Lots of choices for coding languages, along with drag-n-drop IDEs. I think it took me about 15 minutes to pick it up. While the coding is easy, the underlying logic is not. Lots of variables in regards to different terms that mean the same thing, providing easy exits to users who find the bot frustrating or unusable for their particular purpose. Even very simple tasks require some substantial brain power for laying out the logic involved in completing a task through a conversational interface. We’re talking about some complex decision trees. 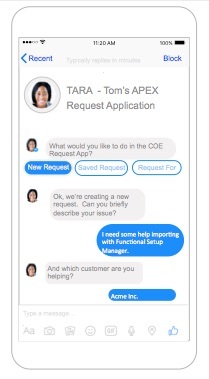 To keep your underlying logic simple and to keep your users on track, build chatbots for very basic and focused tasks: open a service request, buy a pair of shoes, add a dependent to an employee’s benefits plan…that kind of thing. I came away from the workshop with a pretty substantial list of use cases for chatbots in the enterprise. I’ll just share one example here. The upshot is that I walked away from the workshop pretty excited about chatbots. And I’m hoping that my takeaways might whet your appetite. If you want to know more, you can look here. So I'm admittedly a neophyte beginning my exploration of chatbots. What about you? Any experiences? Feedback? Thoughts? Show some comment love and share with the rest of us. Very interesting. With users constrained for time with a zillion things to do, this is a better alternate to searching many webpage.